When Did Disney World Open? Do you love all the Disney theme parks? If so, then you already know—and have probably seen for yourself—that Walt Disney World in Lake Buena Vista, Fla., just outside Orlando, is by far the largest of all the Disney resorts around the globe. Roughly the size of San Francisco, Disney World includes four theme parks, two water parks, more two dozen themed resorts, a shopping-and-entertainment zone, golf course, lakes, and much more. Walt Disney had grand ideas for a Florida theme park to follow his successful Disneyland park in Anaheim, Calif. Not long after Disneyland opened in July 1955, Disney began to see the downside of its location, which was hemmed in by sprawling Los Angeles and thus limited for future expansions. 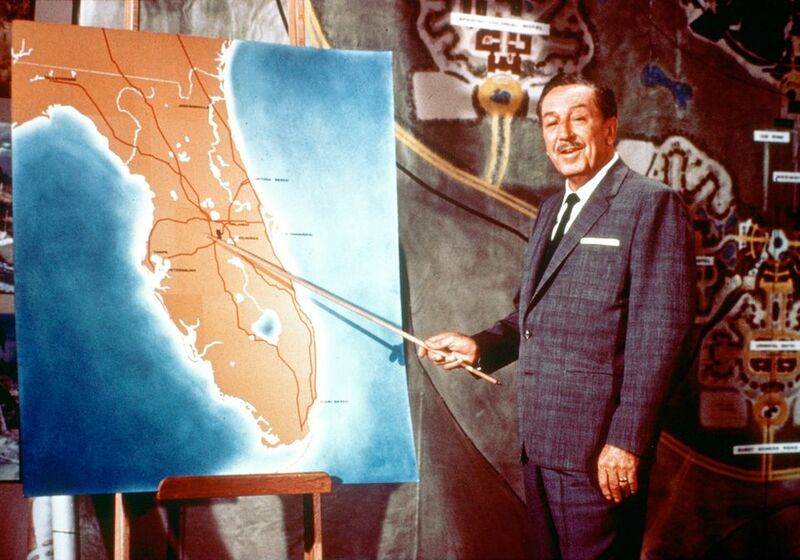 As early as 1959, Walt Disney began looking to acquire land for his "Florida Project." Once the Orlando location was chosen—inland, to limit the risk of hurricanes—Disney acquired 27,258 acres (43 square miles) using dummy corporations to keep the project quiet while the land acquisition was in the works. Disney wanted the vast acreage not only to develop but also to guard against the sprawl of encroaching hotels and other buildings. In 1965, after news leaked about the acquisition, Disney made the announcement. Walt Disney's vision included not only theme parks but also a futuristic city called EPCOT, an acronym for Experimental Prototype Community of Tomorrow. Plans for EPCOT were put on hold while the Magic Kingdom was built first. Unfortunately, Walt Disney didn't live to see the opening of Disney World in 1971. He died on December 15, 1966, and his brother, Roy, took over the construction of the park. If you're planning a trip to any of Disney World's parks, before you go, click through this timeline to learn about the history of this magical place and the new attractions to come. Disney World opened October 1, 1971, with a single theme park, the Magic Kingdom, and three resorts, Disney's Contemporary Resort, Disney's Polynesian Village Resort, and Disney's Fort Wilderness Resort & Campground. The Magic Kingdom is similar to Disneyland Park in California, reprising the same hub-and-spoke layout and many popular attractions. The two theme parks feature Main Street USA near the entrance, a castle in the center, and paths leading to Adventureland, Frontierland, Fantasyland, and Tomorrowland. Walt Disney World is a tribute to the philosophy and life of Walter Elias Disney... and to the talents, the dedication, and the loyalty of the entire Disney organization that made Walt Disney's dream come true. May Walt Disney World bring Joy and Inspiration and New Knowledge to all who come to this happy place... a Magic Kingdom where the young at heart of all ages can laugh and play and learn — together. Dedicated this 25th day of October, 1971. Roy Oliver Disney. Roy O. Disney died later that year. He'd been Walt's partner since the 1920s and earliest Disney cartoon days. Disney World's shopping-and-entertainment area opened March 22, 1975, as the Lake Buena Vista Shopping Village. It has been expanded and renamed many times since. It was renamed Walt Disney World Village in 1977, then Disney Village Marketplace in 1989. In 1997, it became Downtown Disney. After a three-year expansion, the district's name changed again in 2015 to Disney Springs. It includes four sections: Marketplace, The Landing, Town Center, and West Side, each depicting a specific time period. Disney World's second theme park, EPCOT Center, opened October 1, 1982, exactly 11 years after the Magic Kingdom. At 300 acres, it is roughly twice the size of the Magic Kingdom. The park bore the name that Walt Disney had conceived for his "Experimental Prototype Community of Tomorrow," a utopian planned community that would serve as a showcase for American industry and research, schools, and cultural and educational opportunities. Disney Parks scrapped this concept after Walt's death, but visitors can still see certain vestiges of the original concept, such as The Land pavilion, which has a horticulture research section, and Future World's science-and-technology pavilions. The park's name changed to Epcot in 1996. Disney World's third theme park, Disney-MGM Studios, opened May 1, 1989. In 2008, the park's name changed to Disney's Hollywood Studios. The 135-acre Disney's Hollywood Studios has a filmmaking theme, with nostalgia from Hollywood's Golden Age in the 1930s, plus attractions based on blockbuster films such as "Star Wars" and "Indiana Jones." It now covers all of entertainment: music, television, and theater. Disney World's first water park, Typhoon Lagoon, opened exactly a month later on June 1, 1989. A second water park, Disney's Blizzard Beach, opened April 1, 1995. Disney World's fourth park, the extraordinary Disney's Animal Kingdom, opened April 22, 1998, which is also Earth Day. At 580 acres, it is the largest theme park in the world and includes beautifully landscaped areas with Asian and African themes, as well as the more carnival-like DinoLand U.S.A. Among the opportunities to view wildlife, Kilimanjaro Safaris, which takes guests through a replica savanna, is a standout. In 2016, Disney introduced after-dark experiences at Animal Kingdom park, and in 2017, Disney opened Pandora—The World of Avatar, based on James Cameron's film "Avatar." E-ticket attractions in Animal Kingdom park include Expedition Everest and Avatar Flight of Passage, a 3-D flight simulator where guests fly on a banshee across the Pandoran landscape. But wait, there's more. Get ready for two "Star Wars"-themed lands, which will open in 2019 at both Disneyland Park and Disney’s Hollywood Studios. Guests will leave the galaxy and be transported to a never-before-seen planet with a remote trading port. Two attractions currently scheduled for the "Star Wars" section are First Order Dark Ride and the flight simulator called Millennium Falcon Ride. In summer 2018, Toy Story Land is scheduled to open at Disney’s Hollywood Studios. In Toy Story Land, you'll be reduced to the size of a toy and play in Andy's backyard with Woody, Buzz, and other characters from the film. Two attractions will be a family coaster called Slinky Dog Dash and Alien Swirling Saucers, a play set based on the one Andy got at Pizza Planet. Here are new attractions coming to Disney World in the future.